Yesterday it was Henley Royal Regatta, the highlight of the rowing widow’s calendar. On this day, rowing widows of all ages, sexes and other stripes get to sit about with a glass of something lovely in the sun and bask in the glories and joys of their partner/friend/parent/child/etc’s sport. 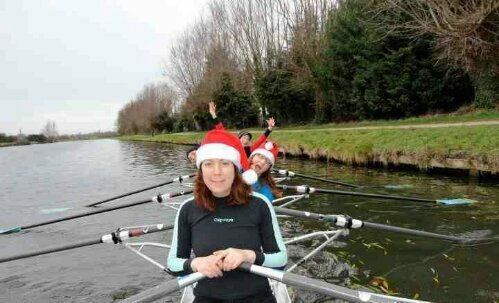 All the other days of the year, the life of the rowing widow is less glam. On the other days the rowing widow inhabits a world of blisters, enormous carb consumption, lycra-draped radiators and arcane terminology (cox, stroke, crab…). Thank goodness then for Henley (and cognate summer regattas the world over), which are our present to our much appreciated rowing widows. Football of course has WAGs, ‘wives and girlfriends’, stereotypically coiffed and swigging Bolly in a hospitality suite, in reality they spend time on windswept five-a-side pitches, and are afflicted with the ‘footy results’ each weekend. They may also suffer the indignity of football memorabilia in their houses (my brother has a Lincoln City collection). Note too the gendered badge: wives, girlfriends…. because no women play soccer of course… The rowing widow badge carries the trace of that gendered interpellation but is inhabited by people of all sorts, and long has been. This, in my view, is one of the many virtues of rowing. It is very inclusive as to both participants and supporters. This is quite remarkable, given the ‘room of one’s own’ imperilled status of women’s sport/leisure in general. (1) this sport is addictive. You may well succumb to the ‘if you can’t beat them, join them’ adage. (2) the belief that if you are dating a rower you will be with a tanned, toned god/goddess is soon dispelled. We eat a lot and like to be chunky. It means we can exert more power in the water. 3) We mutter about rowing in our sleep and ad infinitum (friend Rupert openly says ‘I just glaze over after a while!’). 3) We are full of endorphins, so generally a prankster-ish and jolly bunch. So, in the afterglow of Henley, I am raising a glass to all the rowing widows in my life: cheers, you are wonderful for putting up with me!! Claire Grant is an academic but her true loves are rowing and poetry. She has been rowing since she was a nipper. She lives in Cambridge, England, on the banks of the Cam, dodging swans and river barges. Claire rows for Cantabs and for Boar’s Head. Her principal rowing widows are her partner Liz, her son, Freddie and her bestie Rupert. Great post. Thanks for guest posting. And yes, rowing is strangely addictive. I’m loving it! 🙂 My partner races sailboats so maybe our widowhood evens out in the end.